Ryan saw an interesting quote on a forum some time ago that read, “Port has two duties – to be red and drunk.” Fair enough, but we don’t believe that either “dry” nor “white” immediately come to the majority of people’s minds when they think of Port wine, and maybe it shouldn’t. On the other hand, white port does exist and happens to be one of my favorite wines to sip on a warm summer’s day. Our passion started three years ago when we took a three week whirlwind tour through the central and northern portions of Portugal, including some brief detours to a handful of wineries. After enjoying a few lively and beautiful days in Lisbon, we headed north to Porto, and stayed with some friends of the family in an old drafty castle that made us feel more like royalty than wine sipping travelers. However, being that we were in Porto, far be it for us to miss an incredible opportunity to make our way through the city to the Port houses in Vila Nova de Gaia where we had hoped to have a few glasses of Port along the River Douro. If our memory serves us well, it was at the Taylor’s Port House where we were first introduced to white port. Up until that point, Ryan had sold Port and we had thoroughly enjoyed drinking it back in the States, but we had never even considered the possibility of white Port actually existing. We did, however, poke fun at the idea of white port as a marketing gimmick thought up by some crazy Californian who wanted to bring in some extra “granny” dollars. But imagine our complete and utter shock when at the end of our tour through the Port House, we were given a taste of the Taylor’s Chip dry white port – appropriately named for its dryness after a chip of wood. Not wanting to seem naive, we confidently tasted it, and in doing so, opened yet another minor passion in our wine obsessive hearts. Dry with a light sweetness, nutty with a slight bitterness, refreshing and alive – we both fell in love with it. How could something so delicious be overlooked by so many? Throughout the rest of our trip, we tasted white port every chance we had, typically having a glass before a meal as an aperitif. And upon our return to the States, Ryan quickly began his feverish search for white port distributors. It took quite awhile, but with some diligence he was able to find a case of Chip Dry that looked as if it had been sitting in a warehouse for the past century collecting ample dust. However, it was only a few years old, and despite his initial hesitation, he brought it into his store on the condition that he could return any bad bottles. In the end, out of a case of twelve bottles, Ryan believed that there were only two or three bad ones, although they tasted quite a bit different from what he had experienced in Porto. Slightly aged and showing more of their nutty character, they were tasty nonetheless and opened his customer’s eyes to this “new” style of Port wine. What sparked this White Port conversation? Yesterday, Ryan was browsing the shelves at a local wine store near our house when he stumbled across a few bottles of Quinta do Noval’s White Port. It had occurred to him that his obsession with Jerez wines has left a small hole in our coverage of the other fortified wines on the Iberian Peninsula. So hoping to jog some memories, he picked up a bottle for eight and half Euros and headed home. As you all know, when you go on vacation, the wines that you taste at home never taste the same as they did where you first had them. While living in the States, we found this to be only partially the case – the magic may have disappeared, but we still thoroughly enjoyed the wine. 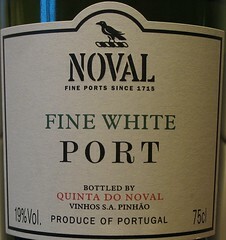 On the other hand, we didn’t find everything we loved about White Port in this particular bottle of Quinta do Noval. It was still a great purchase and quite tasty, but we don’t think that we’ll be turning anyone into a white port fiend with it. Ryan felt that by going towards the sweeter end of the spectrum the delicate nature of the port was ruined. On the other hand, Gabriella felt that the wine was incredibly aromatic and lively, yet the acidity seemed a little out of balance for her. Well, that’s life! But we hope it doesn’t deter you from at least experimenting with this lost treasure! Ryan – Nice pale golden color with thickness visible when poured. Peach and apricot on the nose with a little dusty earth and a herbal note that may come out more as it warms. Thick in the mouth with a medium acidity and some alcohol heat on the finish. I would call it sweet but not as much as a ruby port. The flavors are subtle with peach and apricot showing again mixed with some white flowers and a lightly bitter finish. Not the best white Port I’ve had and yet tasty.Gabriella – Pale dark straw color with slight viscosity. Honey, citrus and peach on the nose with a slight caramel and daisy scent. It reminds me a bit of sitting in a prairie on a bright summer’s day with wild flowers and bees around me. Sumptuous and semi sweet with slightly thick texture in the mouth. Peach, honey and wild flowers, or even a touch of white rose, on the palate. I really enjoy the dance of flavors and scents in my nose and palate, but there is an acidic fire, a bitterness, that hits you right near the end that I don’t like. Paired with some brie, I think it would be fantastic.